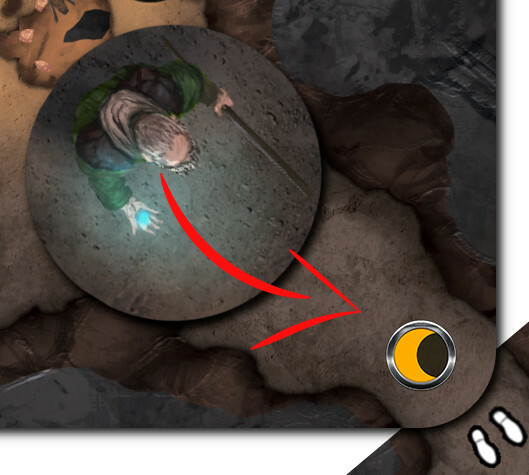 Legends Untold is a co-operative adventure game for 1-4* players. We want to play in depth adventure games but struggle to find the time to set them up or finish playing them in a gaming session. We don't believe we are the only gamers out there with this problem! *The game can be played with 5-8 players if additional sets are used. 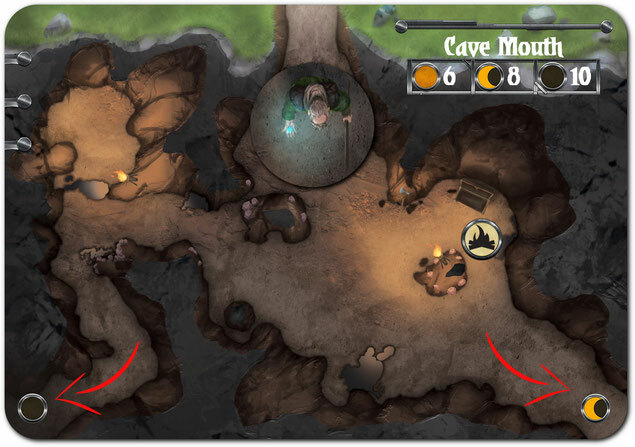 Your party of adventurers have climbed the steep, narrow track and stand within the entrance to a cave complex. Eager for adventure you desire to see what lies deeper within the caves. One of you must become the scout, another must become the guard at the rear of the party. Will you pick the dark exit or the brighter one? Now before you proceed will you sneak to make less noise but at the cost of time? Let's say you chose the brighter exit (we call it ambient), but wary of your time you chose not to sneak. We have moved the party token forwards. Now, draw a new location card. Look for the foot prints and place it under the exit you just used. 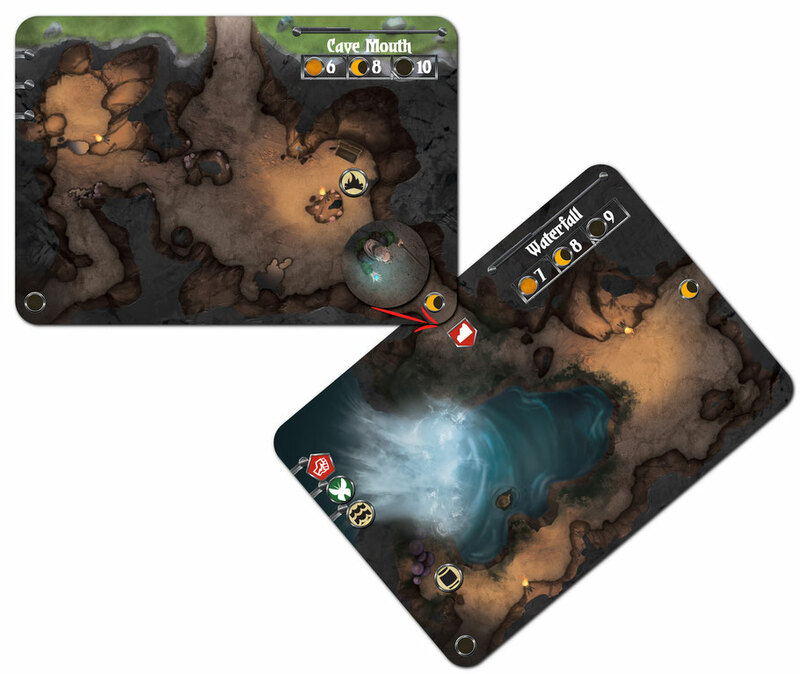 We will continue to slide the new card directly under the old one covering the footsteps and making the cave walls join up. You have just built a map! We call this dynamic mapping. You can see that you have created an ambient corridor. 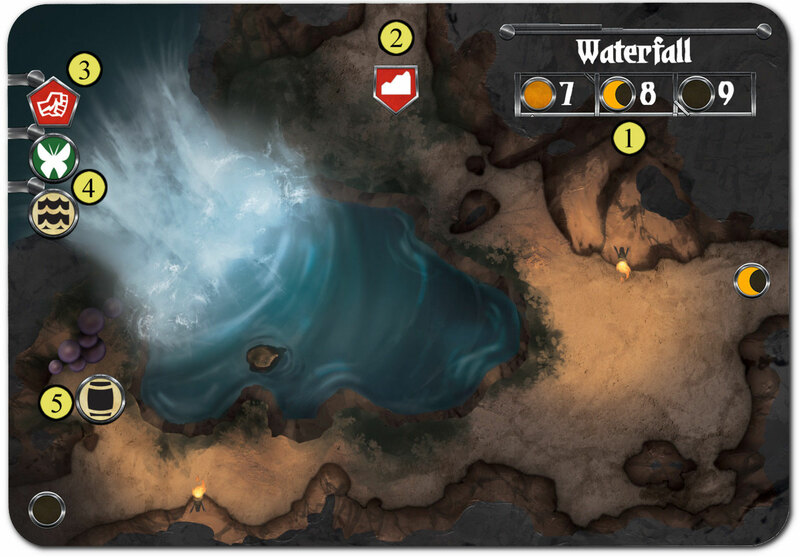 Now that we have added the new section to the map we will focus on the new location card. You have entered a cave with a thundering waterfall cascading into a deep blue lake. Vegetation grows on the edge of the cool water and a thick layer of purple fungi lie off to one side. There are a number of things you must deal with in this new location. 1 - You must establish your readiness (alert, bold or careless) which depends upon the brightness of the corridor you entered from and whether you chose to sneak. 2 - In this location you come across an obstacle. 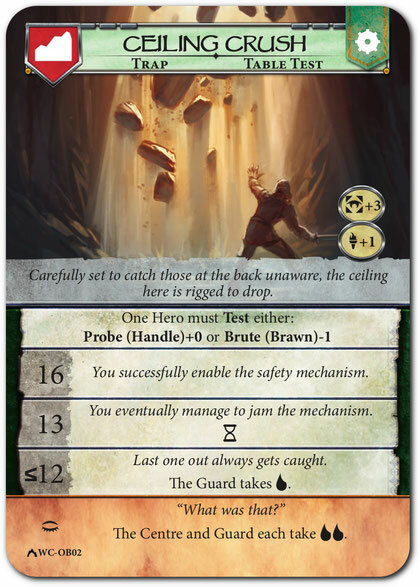 You draw an obstacle from the appropriate deck and reveal...a Trap! 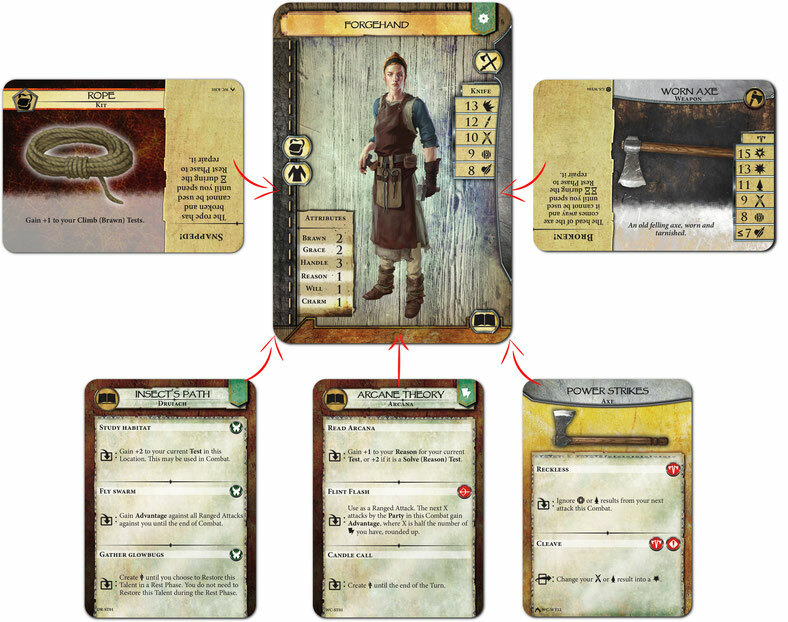 The impact of the card depends on your readiness and party order. There are bonuses to dealing with the trap if you are alert or have a light source. Let's assume the heroes use a mixture of talents and equipment to jam the mechanism (incurring a time cost). 3 - Now we must draw a foe from the adventure deck. 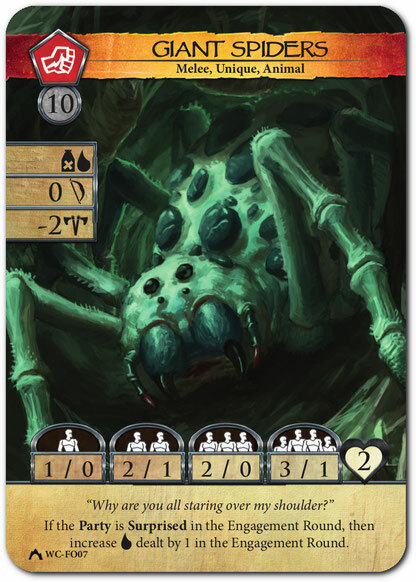 You draw the Giant Spiders card. The surprise rating is 10, you fail to surprise the creatures and you must fight them. They cause extra damage to you but through a mixture of talents and bravery you defeat the lurking danger. 4 - Please note there are insects here and this location is prone to flooding. 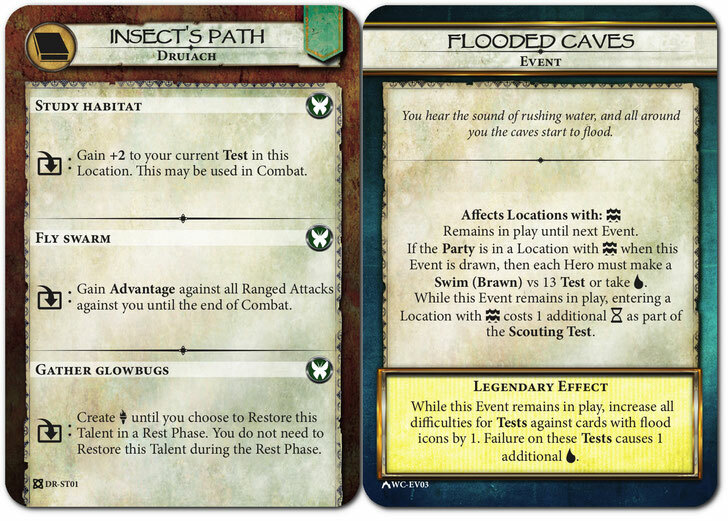 The insects could prove particularly useful for any hero that has chosen a druidic talent. The flooding could play an important role on any events which occur (triggered by time being spent). 5 - There is a search zone here among the purple fungi. If you wish to search it you can choose to spend time and search carefully or search quickly and risk any nasty surprises that lie within. 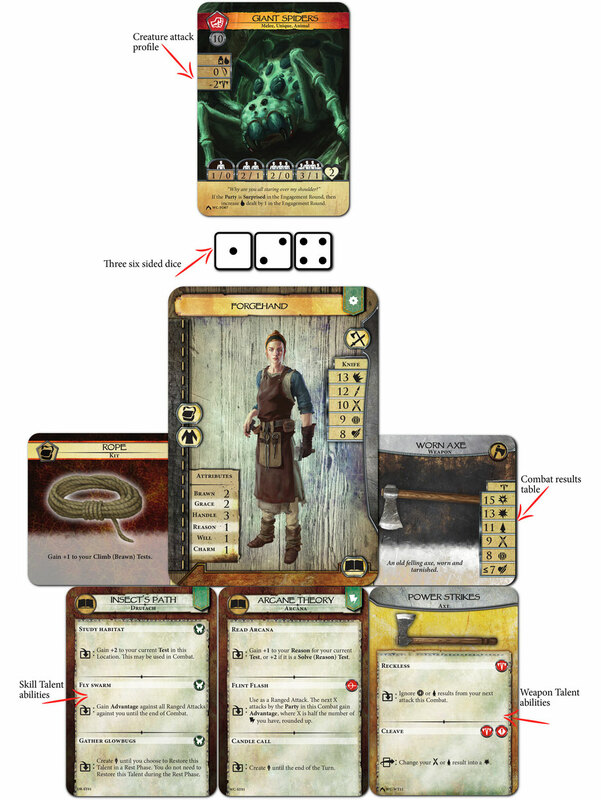 This is just a brief taster of Legends Untold to give you a flavour of how it works. Create the hero you want to play. 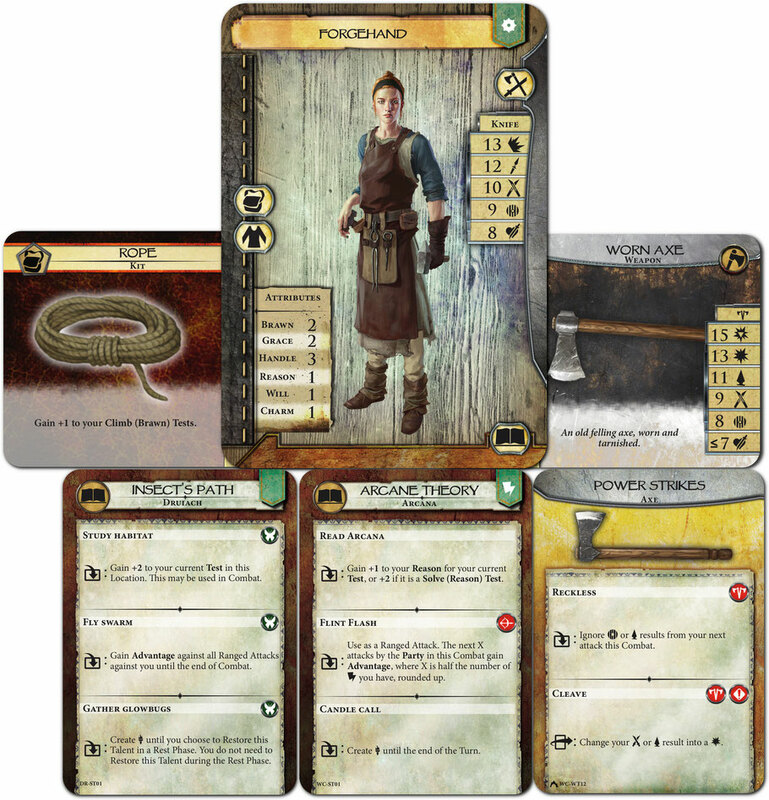 Choose an occupation card and a combination of talents, weapon talents, weapons, outfit and kits to make the hero that you desire. There are no restrictions or classes, just choices. We don't do swing and a hit/miss. Each stage of combat is designed to keep it fresh, fun and different. 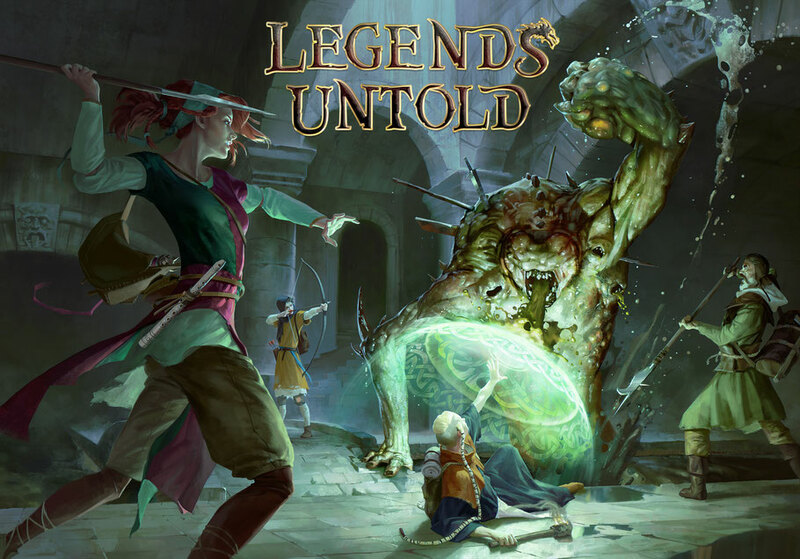 Legends Untold is designed to give you a different experience every time. mix any foe with any environment. Play Goblins in Caves or Lizardmen in Sewers or Undead in Catacombs or mix them up as you desire. Or combine them all to create a Multi Environment Giant Adventure (MEGA) game.